Reese Witherspoon and Ryan Phillippe were seen together this weekend as they were supporting their son Deacon’s sports performance. The two Hollywood actors seem to be in a very good relationship, even if they went through a divorce. It appears that Deacon’s schedule for Saturday was pretty busy. He had a football game that took place in Brentwood (L. A. neighborhood). So both parents took some time off cheering for their boy together. Ryan and Reese have reunited before on events that were important in their son’s life. Before the Saturday game, they had a chance to reunite again in order to celebrate Deacon’s birthday party, last year in October. He was turning 7 and they decided to throw him a party at the W hotel in Los Angeles. Reese and Ryan broke up because apparently he was cheating on her with a co-star. The press has reported they were seen having many public fights and at one time Reese even got to read in his BlackBerry some incriminating proof that he has someone else. The actress wasn’t very happy about her husband was not acting like a married man and she called the shots: they were separating. Nowadays, things seem to be a lot better between them. 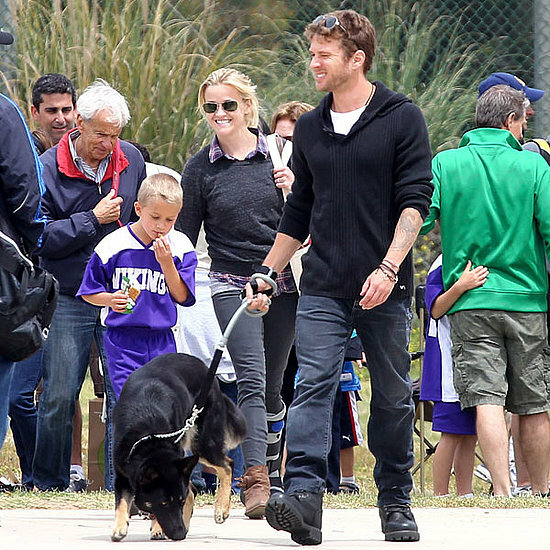 Last Sunday, they were both enjoying a day out with their son and Ryan’s dog, a gorgeous German shepherd.